in dit nieuwe, revolutionaire, Battery Management Systeem wordt elke cel/ accu voorzien van een klein printplaatje (ook wel 'board' genoemd). Door middel van een enkele draad zijn deze boards verbonden met de BMS-controller. Op zijn beurt verzamelt de controller alle relevante data (zoals het aantal cellen, de plaats van de cellen, voltage, temperatuur en doorgangsstroom van elke cel, plus het totale voltage van het accupakket) om het oplaad-proces gecontroleerd te laten verlopen. Een geïntegreerde USB interface stuurt de informatie naar een electronisch dashboard, waarop alle informatie wordt gevisualiseerd, evenals de actuele stroom en de accucapaciteit die resteert. NB: de rest van de informatie is in het Engels en wordt binnenkort door ons vertaald. Mocht u tot die tijd er niet uitkomen of vragen hebben, dan kunt u ons hiervoor altijd even mailen of bellen (zie contact voor de gegevens). 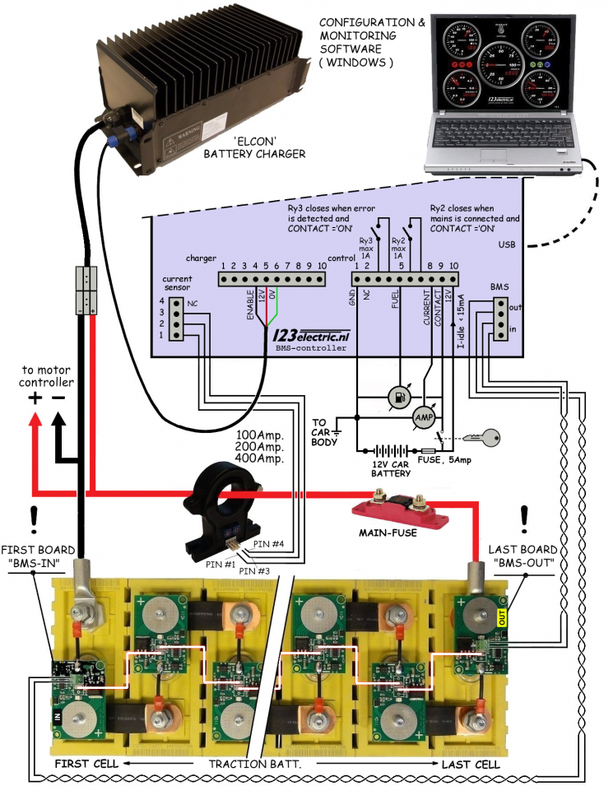 This diagram gives a nice overview of a wired system consisting of a single pack of batteries with BMS-boards, the charger, the current-sensor and in the middle the circuit-board of the 123electric BMS-controller. Please note: for sub-divided battery-packs, each sub-pack will have to be equipped with its own BMS-'IN' and BMS-'OUT' -board! To measure current during charging and dis-charging, the current sensor should be connected in the position indicated. This is important, as this sensor is used for the so-called Coulomb-counting software, with which the BMS-controller calculates the remaining battery-capacity. The charger is directly controlled from the BMS-controller, without the need for a CAN-interface. The standard three-wire-input connected to the 'charger'-terminal on the BMS-controller is all that is required. The 'control'-terminal is galvanically isolated, so you can safely connect this to the 12 Volt system of the car. On top of that, one can set the maximum charging-current of the charger, and the minimum current. One can choose between the Quick- and Balanced-charging-algorithm. In some countries mains-current is cheap in particular parts of the day. For this reason we have added a real-time clock. If you program an equal start- and stop-time, the timed charging is in-effective. It is not necessary to enter the number of cells....the system gathers that information by itself, and automatically adjusts the charging-algorithm.